Here at Phones Review we enjoy bringing our readers all the developments regarding new and upcoming smartphones and recently the LG Optimus G has been the subject of plenty of attention. Today we have some details of a hands-on look with this powerhouse phone with a video and photos, as well as some news on when the phone will be released. The LG Optimus G is LG’s newest flagship smartphone and from what we’ve seen so far it will fly off the shelves once it’s finally launched. It has a 1.5GHz Qualcomm Snapdragon S4 Pro quad-core processor, 4.7-inch True HD IPS PLUS display with resolution of 1280 x 768, 2GB of RAM, 32GB of internal storage and 13-megapixel rear camera. 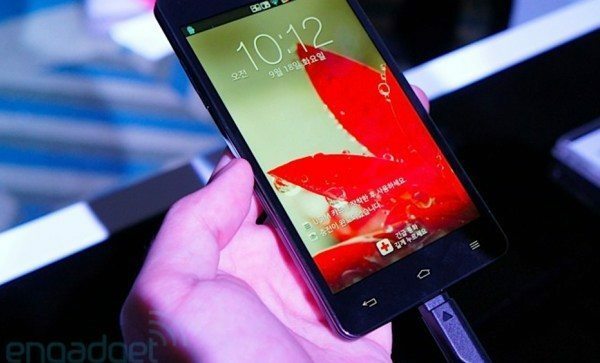 It also has LTE connectivity, NFC, a 2100mAh battery and it runs on Android 4.0.4 Ice Cream Sandwich. It’s a shame it’s not 4.1 Jelly Bean but we imagine an update will follow at some point. At a recent hands-on experience with the LG Optimus G, Engadget came up with a video to show us a little more and you can view that video below this story and also see some of the featured photos of the phone. First impressions from Engadget seem extremely favorable with the design earning some praise at only 8.45mm thick and weighing 145g and with very decent build quality and materials. 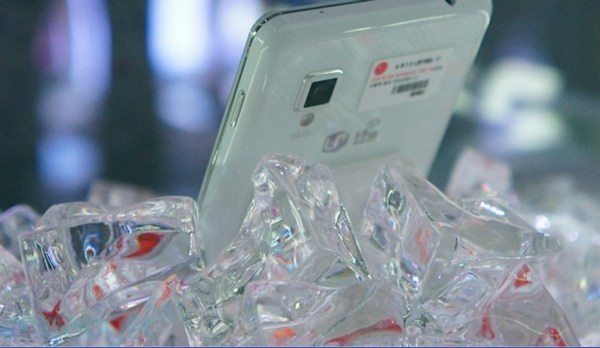 The rear of the handset features the Crystal Reflection process, which though attractive is described as a “fingerprint magnet.” We have to say that taking a look at some of the photos and videos we agree that this is a fine-looking handset. Looking at the Optimus G close up, Engadget spotted a notification light next to the front-facing camera, volume rocker and micro-SIM slot to the left side and to the right the power/ lock key. At the top side there’s a headphone jack while the USB/ MHL connector is located at the bottom. The one thing so far that received a slightly negative comment was the display, described as “high-quality,” but not “mind blowing,” so that doesn’t exactly sound like a major problem. This is only initial thoughts from a brief few moments with the phone but gives us a brief idea of what the Optimus G has to offer. As well as this we have some release news for you as Droid-Life has now informed us that the LG Optimus G will be coming out in Korea next week and other regions across the world in October according to press release information. You may be wondering if the ultra-impressive Optimus G will be released in the US and considering an LG press event is being held tomorrow in New York where we expect to see the phone, it seems highly likely that it will become available stateside. Remember to take a look at the Optimus G in the video below if you want to see the phone in all its glory. Are you waiting to get your hands on the LG Optimus G? Send your comments to let us know.